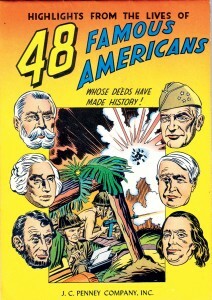 Simon & Kirby produced 48 Famous Americans as a giveaway for the J. C. Penney department store upon their return from serving in World War Two. One note of interest is the book is small – only 5 1/4″ wide by 7 1/2″ high, with the binding stapled at the top. 48 famous Americans included pages devoted to such Civil War figures as Abraham, Lincoln, Ulysses S. Grant, and Robert E. Lee.